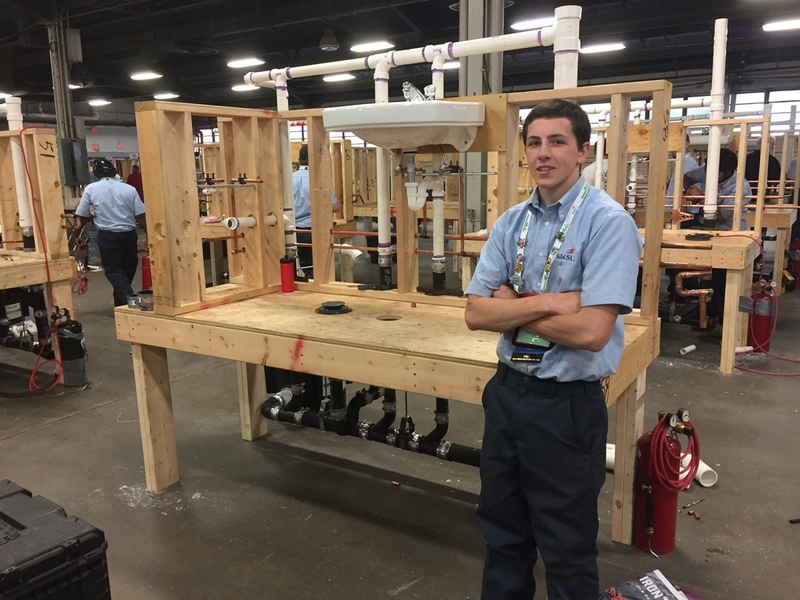 Tyler Newman, a 2017 graduate of Watertown High School and of the Plumbing/HVAC program at the Charles H. Bohlen, Jr. Technical Center, finished fifth out of 32 competitors from across the country as part of the Plumbing competition held during the National SkillsUSA Leadership and Skills Conference, June 19-23 in Louisville, KY. Newman earned the right to compete in the nationals following a gold medal first place finish in the same category during the New York State competition held in April. Faculty advisors for the SkillsUSA chapter at the Bohlen Technical Center were also honored for their silver medal win in the Presidential Volunteer Service Award during the New York State competition for completing a total of 536 hours of community service. They are Justin Hall, Patricia Cohen, William Landers, and Tara Pawlowski. The Watertown chapter was also honored as a gold medal winning Chapter of Distinction. SkillsUSA is a national partnership of students, teachers and industry representatives working together to ensure America has a skilled workforce. SkillsUSA is a national membership organization serving middle-school, high-school and college/postsecondary students who are preparing for careers in trade, technical and skilled service occupations, including health occupations. Chapters are located locally at both the Charles H. Bohlen, Jr. Technical Center in Watertown and at the Howard G. Sackett Technical Center in Glenfield.